We need some background to today’s Scripture passages. In our Old Testament story, Hannah was the true love of her husband Elkanah. Elkanah’s other wife, Peninah, was abundantly fertile, but Hannah could not conceive. This was a disaster for Hannah. To have children, especially sons, was the hallmark of ‘wifedom’ in ancient Israel. 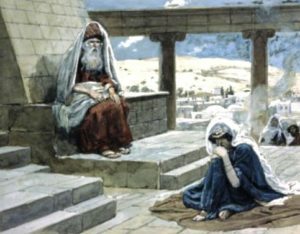 The story of Elkanah and Hannah parallels that of Jacob and Rachel. Jacob’s father-in-law had tricked him into marrying Leah, but he really loved her sister Rachel [Genesis 29]. Like Peninah, Leah had several children, but Rachel remained infertile for a long time. 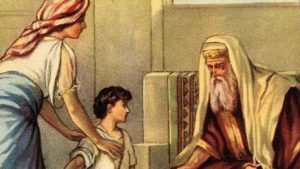 Eventually, Rachel had a son, Joseph, who ultimately became a leader of Israel. Elkinah said to Hannah, “Am I not more to you than ten sons?” But that did not console Hannah. She prayed to God to give her a son. She even promised to offer her son as a nazirite (a priest). After Hannah’s son, Samuel, was born, he was brought up by Eli. Like Joseph, he became a great leader. We can also use the story of Hannah and her son Samuel, to prepare us for Advent. Hannah, Eli, and Samuel, have parallels with Elizabeth, Zechariah, and John the Baptist. Elizabeth was unable to conceive); Zechariah was a priest; and John the Baptist was a prophet who would not drink strong wine. There are other parallels. Like Hannah, the Virgin Mary conceived miraculously. Also, Hannah’s song, which we used in place of today’s psalm, is similar to Mary’s song, the Magnificat. Both songs praise God, and offer the hope of a better future for people whom life has treated badly. We met the same hope two weeks ago, when we read the Beatitudes, part of Jesus’ Sermon on the Mount. That Biblical ideal has inspired humanity through the ages. One day there will be a time of peace and justice. Then everything that is wrong in the world will be put right. Our reading from Mark, Chapter 13, picks up the theme of a new and better world. As a whole, the chapter is a collection of sayings that refer to the end of time (also called the end of the age). On that day, God will come in glory to set wrongs to right. We can read today’s short extract in that larger context. The idea of the end of time (called apocalypse) first emerged in Jewish literature in the Book of Daniel. That book appeared a couple of centuries before Jesus. The end of the age loomed large in Jesus’ day because so much had gone wrong. The Romans were occupying the Holy Land. They enforced their rule by executing people by crucifixion. There was great inequality (sounds familiar). Farmers were losing their land because they couldn’t repay the loans they had borrowed to pay for seeds. People asked, Where was God in all this? Had God forgotten his chosen people? Jewish folk figured that God must be biding his time. Surely he would soon come and usher in a new age of justice and peace. First century Jews believed that this new age would come here on earth, not in an afterlife. Righteous people would get their reward of eternal enjoyment. God would raise the righteous dead to enjoy it too. The Christian view of the end of the age, as described in the Book of Revelation, has similarities. At the final Judgement Day, four horsemen would come. They represent Conquest, War, Famine, and Death – or, in some interpretations Pestilence, War, Famine, and Death. There is an important difference between the Jewish and Christian views of the apocalypse. The Jewish one imagines that the righteous will live for ever in a just and ideal world, presided over by a benevolent God. The Christian view emphasizes that sinful people will get their comeuppance. Micah Kiel writes that much of Mark Chapter 13 is ‘apocalyptic boilerplate’. These themes and images had been common in Jewish literature since the Book of Daniel. At this point in the Gospel, Jesus has finished his itinerant ministry in Galilee. There, he preached the good news of God’s coming kingdom and performed acts of healing. After Jesus arrived in Jerusalem, he criticized the Temple authorities, as we saw last week. Chapter 13 comes next, followed by Jesus’ arrest and crucifixion. In Chapter 13, Jesus looks like a half-crazed preacher haranguing the crowds on the sidewalk of a modern big city. What he says almost seems to refute Jesus’ opening words in Mark’s Gospel, “The time is fulfilled. The Kingdom of God has come near” [1:15]. Not, “will come near one day”. Not, “will be present in the afterlife.” But, “has come near”, in the here and now. I also feel uncomfortable with the beginning of our Gospel reading. The disciples admired the Temple building. It had undergone a significant reno about the time of Jesus’ birth. Its magnificent white stonework, set on Mount Zion, could be seen for miles. Jesus told them that one day it would all disappear. Every stone will be thrown down. My problem is that Mark’s Gospel was written just about exactly when, historically, the Romans put down a Jewish revolt. 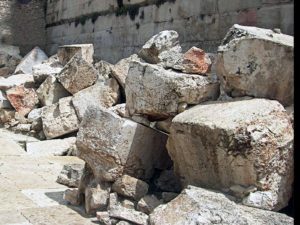 As a punishment, they destroyed the Temple. Did Jesus actually predict that, 35 years before it happened? Or did Mark put that contemporary information into Jesus’ mouth? I found a helpful analysis of the reading in a recent essay by Samuel Carr. Jesus had criticized the Temple authorities. Poor people, like the widow in last week’s reading, had helped to pay for rebuilding the Temple. But its destruction would have affected the elite in Jewish society more than the likes of the poor widow. In Carr’s view, Jesus seemed to be saying that the “sin” of first century society was not personal wrongdoing. It was the institutional ill-treatment of the poor and oppressed. Radical (apocalyptic) change was needed to bring about God’s more perfect society. Carr challenges us to think about who else to include today among the oppressed – not just the poor and orphaned, but refugees, transgender people, victims of wars etc. Nevertheless, I cannot help scratching at my personal itch that in Chapter 13, Mark may have quoted Jesus out of context. But I guess that is my problem, not yours.